Five months ago, Western Digital completed its acquisition of SSD and NAND flash manufacturer SanDisk, adding consumer SSDs and more enterprise SSDs to their existing portfolio of hard drives and HGST enterprise SSDs. WD is now introducing two families of WD-branded consumer SSDs, each derived from existing SanDisk product lines. 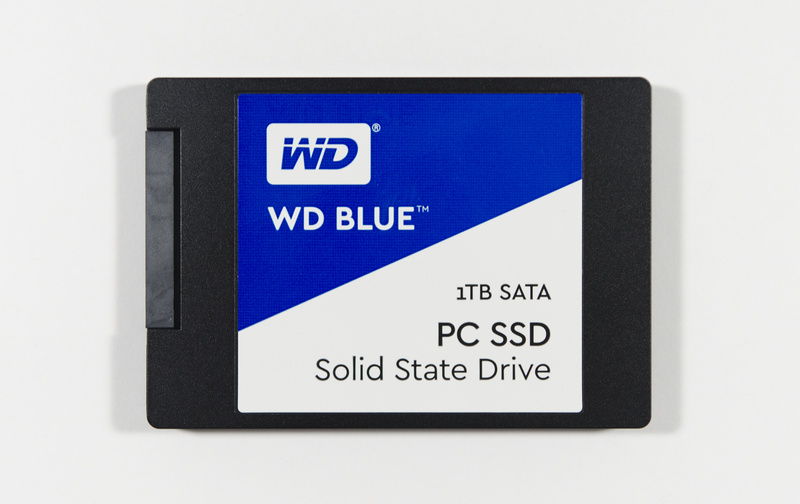 The WD Blue SSD is based on the SanDisk X400 SATA SSD with minimal hardware changes but has modified firmware and different usable capacities. Like the X400, the WD Blue is available as either a 2.5" or M.2 drive and uses SanDisk 15nm TLC NAND with the Marvell 88SS1074 controller. Our review of the 1TB WD Blue SSD shows that it improves on some of the X400's weaknesses but sacrifices some performance on many tests, producing a drive that is not quite as fast overall. The MSRP for the WD Blue is about the same as current actual retail prices for the SanDisk X400, which position it as a mid-range SATA SSD and puts it up against formidable competition from the new wave of drives using the more affordable 3D TLC NAND from Micron. The WD Green SSD is an entry-level product line with limited capacity options. Based on the SanDisk SSD Plus, it uses a Silicon Motion controller in a DRAM-less configuration with SanDisk 15nm TLC NAND. The WD Green has a similar purpose to drives like the Samsung 750 EVO and the recently-announced OCZ TL100: to offer the lowest possible price while still providing acceptable reliability and a noticeable performance jump over hard drives. Higher capacities are omitted from the product line because the total price would be too high for the most cost-sensitive consumers even if the price per GB is marginally lower than a more mainstream budget drive. While the Green label has connotations of better than average power efficiency when applied to WD's hard drives, the low performance of DRAM-less SSDs usually leads to poor energy efficiency during active use and the idle power savings tend to be minimal. The WD Green will be available later this quarter, and pricing has not been announced. Cost-wise, we're not there yet. I doubt that will happen until 3D QLC drives start appearing. (Although these (probably) won't be suitable as system drives due to very limited flash endurance.) Flash is a very, very large portion of the price of an SSD - and larges as capacities grow. While the price delta between a high-end and low-end 120GB SSD might be huge (less than $40 for the cheapest 120GB SATA SSD at newegg, vs. $107 for an 850 Pro, a 167% price increase), that difference diminishes very rapidly (at 256GB, the delta is $60 to $122, or just 103% more). Also, as price competition grows and margins shrink, the only way for SSD makers to profit from drives like these would be volume, and sales of $200+ SSDs are just not large enough for this. "I think there's a market for people who want bigger and bigger SSDs but are willing to trade a lot of performance (but not necessarily reliability) -- if that were possible."